The Mercedes-Benz S-Class has always been a technological tour-de-force, and the latest generation of the S-Class Coupe and S 63 AMG Coupe take this to a whole different level. A thrilling drive or a step too far? The Mercedes-Benz S-Class has always been the technological wunderkind. I’ve had the good fortune of steering a few elder generations of the Sonderklasse long after their release, and have always been amazed that the technology equipped within these 10-15 year old luxury barges hasn’t felt out-dated, or in any way surpassed by younger, impudent rivals. This has always been the raison d’etre of Mercedes’ ‘Special Class’, offering as it does a glimpse into the future. But therein lies a problem. Which brings us to today, and the sixth generation’s international launch. This is the first time I’ve set foot in a contemporary model S-Class – the latest glimpse into our automotive future – and I’m a little hesitant. Certainly the S-Class Coupe is a handsome looking machine, and ‘handsome’ is the correct word. It’s muscular, without being steroid-ripped. It has presence, and seems at first to be quite a large car, but this is an optical illusion. The greenhouse area is low, small, and while Mercedes did away with the sunroof and now has a big canopy in its place, this allowed its designers to lower the roofline, increase aerodynamics, thus making this the ‘quietest series production car’ in the world for wind noise. That’s clever design, not technology. Davison approved. From inside, it’s a lovely place to be. 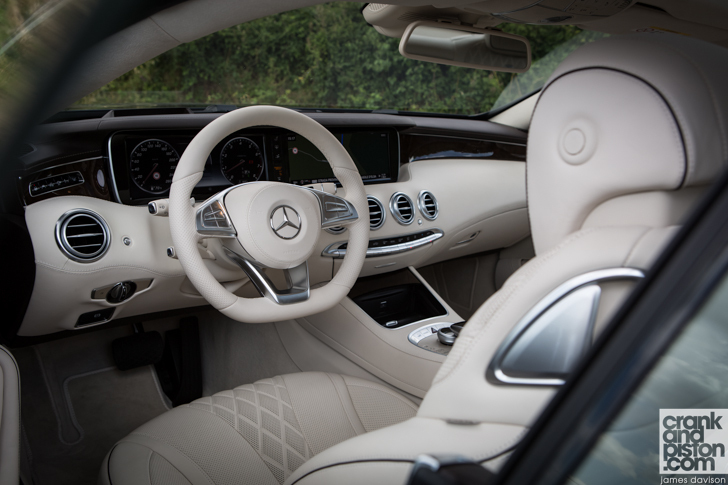 The smaller greenhouse area in no way interferes with headroom, and the swathes of white leather in our test model are just the quality you would expect from Merc’s flagship coupe. Unusually though, with this low roofline, for someone of my height, and with the sun visors deployed, my view ahead is completely obscured. Such mundanities however are forgotten upon exiting the multi-storey car park and hitting the Autostrada in beautiful Tuscany. The ride is extraordinary. Comfortable, with plenty of poke unleashed from the 455hp 4.7-litre biturbo V8, give or take a beat. But even though we’re still sitting on the highway, it’s in the corners that an odd feeling can be felt through the seat, which doesn’t comply with my understanding of physics. The Mercedes-Benz Intelligence Drive now offers Curve Tilting that automatically adapts the suspension, allowing the vehicle to lean into the bends like a motorcyclist. Exiting the corner there’s a correction, barely detectable, of something mechanical stabilising the car. Somehow compensation has been compensated for automatically, a feeling that’s further emphasised through the twists and turns of the rolling Italian countryside when we ditch the Autostrada. And it’s downright bizarre: I’m not going fast until I look at the speedometer, and realise I’m over twice the speed limit. It can’t be possible. It feels like we’re cruising. There’s no sudden shift in lateral G-Forces. And so here I am, reclining slightly on beautiful leather seats, bracing for the upcoming corner, which is totally unnecessary: I’m uncomfortable in possibly the most comfortable car I’ve ever been in. Theoretically I understand what is going on. 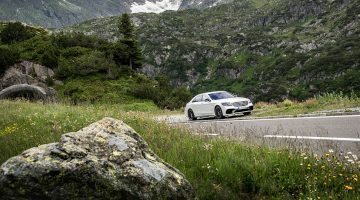 I’ve read the press release, I’ve been given the official lowdown by Mercedes’ representatives, and I’ve read our man Bassam’s feature of the S-Class saloon. I’ve done my damned homework, but I’ve never experienced this before. It’s about 3pm, and we’ve reached our destination for today. I pocket deep-seated conundrums for Merc’s engineers I’ve stored in-mind during the morning – “if the S-Class is so technologically advanced, why the hell doesn’t it have a cup holder?” – to corner a dude who looks like he’s the boss, and ask if I can take the S 63 AMG Coupe out for a spin (fortunately he says “yes, but be back in time for dinner”). There are two reasons why I want to do this. Tomorrow’s drive in the AMG is much like today’s highway-heavy drive, but in reverse. More importantly though, I need time to ‘interface’ with these new technologies: does more power equate to more driver involvement? The instant the push button starter is push-buttoned, that gratifying AMG call to action roars forth. Which, annoyingly, is then immediately muted to almost imperceptible levels. It’s the first of many signs, as the wheels begin to roll, that there’s something curiously un-AMG-like about the S 63 AMG Coupe. 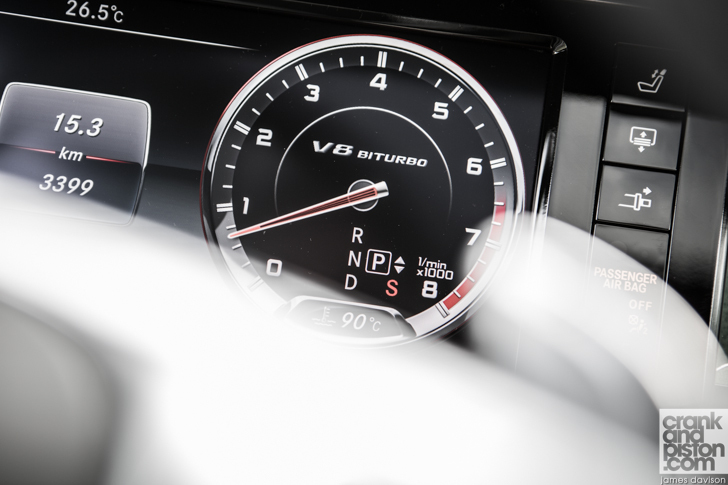 The 5.5-litre biturbo V8 – tuned now to produce 585hp – pulls like a champion, with more torques than Tomás de Torquemada. Ironically the changes through the seven-speed AMG SPEEDSHIFT gearbox have been programmed for smoothness rather than closeted violence you’d expect from an AMG. This is a conscious decision from Mercedes, allegedly based on those all-important customer feedback reports that apparently give a higher priority to the smooth transition between gears than outright performance. 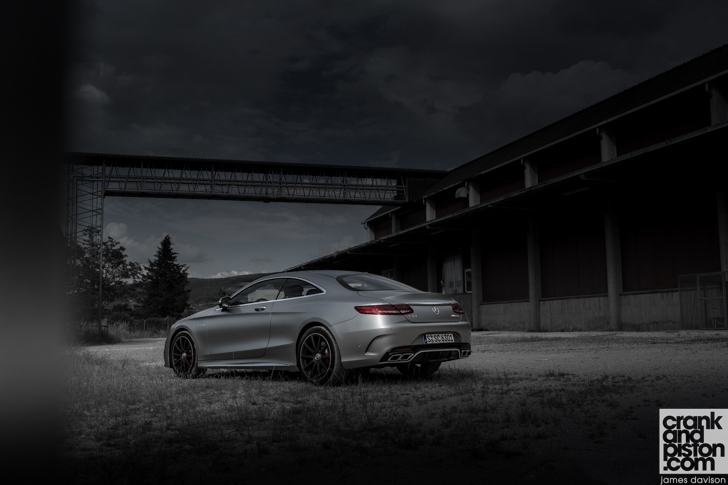 It would be a complete denial of reality to say that this car is slow – in fact it’s rapid – yet this ramping up of AMG horses and torques also accentuates the curious sensations felt in the ‘standard’ S–Class Coupe. And I feel I should explain that these new technologies are not performance-orientated. They’re primarily for comfort and safety. In an AMG. Magic Body Control for instance operates via a windscreen-mounted stereo-camera, which projects 15-metres ahead of the car. It predicts corners, undulation, and pre-loads the suspension in preparation for upcoming road conditions to improve occupant comfort. I’m not hanging about, a brief look at that speedo confirming that I’m doing a rapid rate of knots in a large car on a totally unsuitable road that would leave a hot hatch for dust in my rear view mirror. And still, the S 63 AMG just doesn’t feel fast. It is BLOODY fast. It just doesn’t FEEL it. Leaning into the corners like a slalom skier, stability is beyond reproach thanks to the intelligent Mercedes suspension at work. But for the driver, there’s none of the adrenaline rush felt by the skier. There’s no lateral G to brace for, the suspension removing it from the equation. Newtonian law – I think it’s his third law – states that every action has an equal and opposite reaction. In Mercedes’ new Sonderklasse line-up, the action is reacted upon by the car and not felt by either the driver, the passenger, or the little fly that’s taken up home (comfortably) on the AMG embossed armrest. The ride is further manipulated by Airmatic suspension, Adaptive Damping System and a long list of other technological wonders, none of which are performance orientated. Which to my mind doesn’t make sense in an AMG. Where’s the ‘go faster’ button? This might well be the future, and it’s impressive certainly. The comfort cannot be dismissed, the safety features are incredible, and the new Coupe (AMG or otherwise) is obviously a handsome car in which you could destroy thousands of kilometres at a rapid rate yet still feel refreshed at journey’s end. On offer is true innovation, the kind that years down the line will become ‘the norm’ in day-to-day saloons, coupes and hatchbacks, like parking sensors and airbags. But there’s a price, and that price is remoteness: it’s an experience akin to sitting in the VIP box at a concert in perfect comfort and luxury, whilst those in the front row are up close and personal with everything. Surrounded as I am by this brilliant technology – Mercedes continuing to push the concept of what a motor car can do to a new level – I am the weakest link in this chain. And I’m not sure I like that.